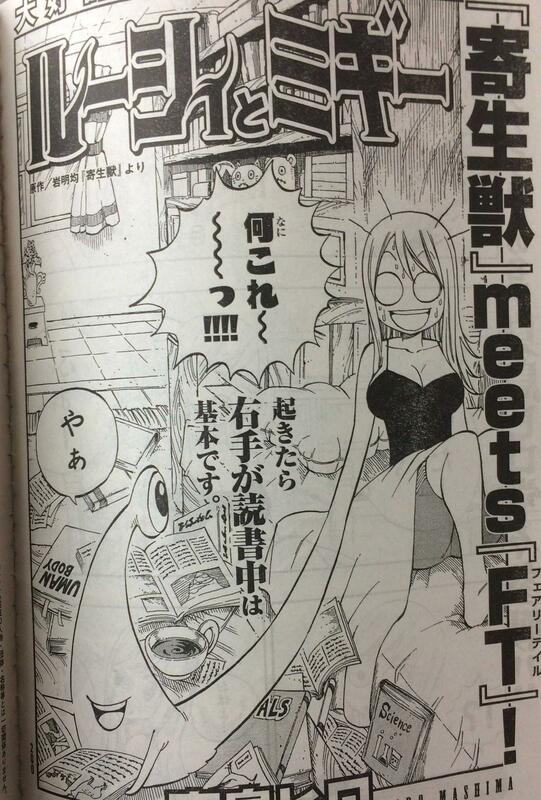 Fairy Tail and Parasyte see’s a crossover chapter being published as Lucy and Migi enter their own world. Fairy Tail’s Hiro Mashima teams with up Kodansha’s Parasyte for a one-shot crossover manga chapter, which will be published in the October issue of “Afternoon”, on the 25th of August. Lucy and Migi is the 9th story within the Neo Parasyte homage to Hitoshi Iwaaki’s series. As seen in the images below, you can tell that it’s a story for both for fans of both of these series. If you watch or read any of these series, tell us how you feel about this interesting crossover between a Magical and Horror Crime series. Go ahead and use the comment section down below to tell me how you feel. Hey, that means you need to get caught up on Parasyte ASAP :p Although, I think you already saw the show right? Should be an interesting crossover, the two series definitely contrast each other quite a bit. I’ve seen some of the episodes. I stopped half way and completely forgot about the series lol. I’ll find some time soon to watch it. Yeah Parasyte is a damn good show, and yes they definitely do, I would’ve like someone other then Lucy to be Migis partner, but I don’t mind. Not a cross over I would have ever expected. If I was Migi I’d be happier being attached to Lucy over a nerdy kid. Fairy Tail was likely picked because it s one of the biggest series in Weekly Shounen Magazine, giving a crossover with it the potential to get a large number of people to check out Afternoon magazine. I did not expect Lucy being the one who gets the parasite.